Double world champion Fernando Alonso gave a 10 million euro ($13.33 million) thumbs-up to future Formula One success with Ferrari Monday. 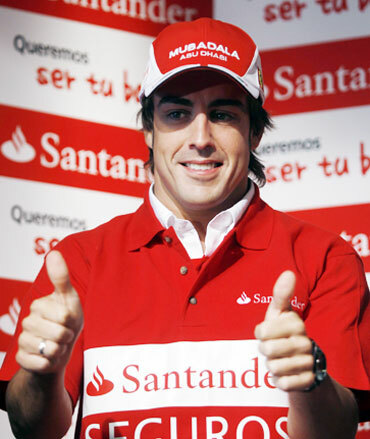 Team sponsors Santander said they had insured the Spaniard's thumbs for five million each as part of a publicity campaign for accident and life insurance ahead of next week's Spanish Grand Prix in Barcelona. "Alonso's thumbs are a symbol, as well as being essential for driving a Formula One car, in that they make a sign of victory and show that everything is under control and well protected," the bank said in a statement. Alonso, who joined Ferrari this season after winning championships with Renault, told a news conference in Madrid that he hoped the first European race of the season would reinforce his title challenge. 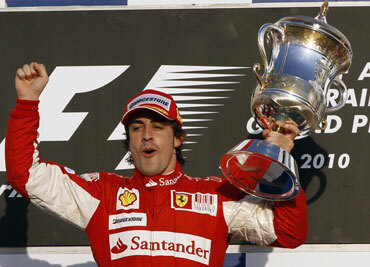 The Spaniard, winner of the Bahrain season-opener, is third overall after four races. "The time has come to show who is up for winning the championship and who is not. Now in Europe the moment of truth has arrived for drivers and teams who are going to show who is able to develop quickest," said Alonso. "A nice fight is starting," he added. Alonso said he was not worried about his Ferrari engine after suffering a failure in Friday practice at the last race in China. "I'm sure we will have a great car in Barcelona and I am not worried," he added. "The Ferrari mechanics are very confident that they have resolved the problems and I hope the fans have a fantastic time and there is a great atmosphere as ever."